CAN YOU NAME THESE FISH? Without looking them up in a book, can you identify the fish in the Gallery above? I live on Tenerife in the fabulous Canary Islands, with its blue skies, blue sea, a wonderful climate and abundant sea fishing available, all year round in the sun. You would think that life was completely fulfilled. Yes, it is paradise, or would be if there was Fly Fishing for Trout! Unfortunately, sunshine all year round means an arid climate. There are no rivers and water in the ponds too warm to sustain my favourite game fish. So what to do? Easy, find a summer holiday home in Europe. Somewhere where there are mountain streams and lakes, rivers and streams running through forests. That is exactly what I did, and being fairly fluent in the German language, decided to look at Fishing in Germany. We visited the Bavarian Forest and found a permanent caravan site in Eging am See. This was ideally situated being close to Passau as well as the Austrian and Czech Republic borders. The site, Bavaria Camping, is a lovely park at the edge of the Bavarian National Forest and the River Ilz. This is a fly only river, only twenty minutes away. A little closer, five minutes by foot, is Eging Lake. Here you can practice all types of fishing and the lake has rainbow trout stocked. Permanent sites at Eging are quite large. The one we found not only has a large caravan but also a purpose-built hut attached. It also has a large front garden, and a rear garden adjoining the forest. There is a pergola for outside dining, another hut for additional accommodation, a tool shed and outside facilities. Fishing Germany sorted, my very own Fishing Cabin in Bavaria! Fishing base sorted out, we moved in and I started checking out the requirements for permits and licensing. As a visitor, I could get a license allowing me to fish for four weeks. That was great, but we intended staying for five months, what about the rest of the time? The answer was clear, if I wanted to fish the rest of the season I would have to take and pass the State Fishing Examination. This was a six-day course, over three weekends, with the State Examination held centrally. Although I consider myself quite knowledgeable, I realized that I would have to do some studying over the winter before attempting to join the course, even if only to be able to identify the fish in the German language. The scientific study of the movement, distribution, and quality of water. This includes the water cycle, water resources and environmental watershed sustainability. By any stretch of the imagination, the syllabus was demanding, even for a native German. However, armed with my studies over the winter I presented myself to the Fishing Association in Plattling. After enrolling, I sat in the classroom for about an hour, not understanding a word spoken. I raised my hand and said to the Instructor ‘I thought this class was in German?’ He smiled at me and in his thick Bavarian dialect replied, ‘No, it is in Bavarian!’. I subsequently learnt that the Bavarian course and examination is, considered the hardest to pass in the whole of Germany. Apparently, some residents elect to take the examination further north. I was not deterred, at least I could understand the slides and hand-outs, they were in German! During day two of the course, I actually started to understand some of the dialect. I also believe that the Instructors took pity on me and attempted to speak slowly and clearly. 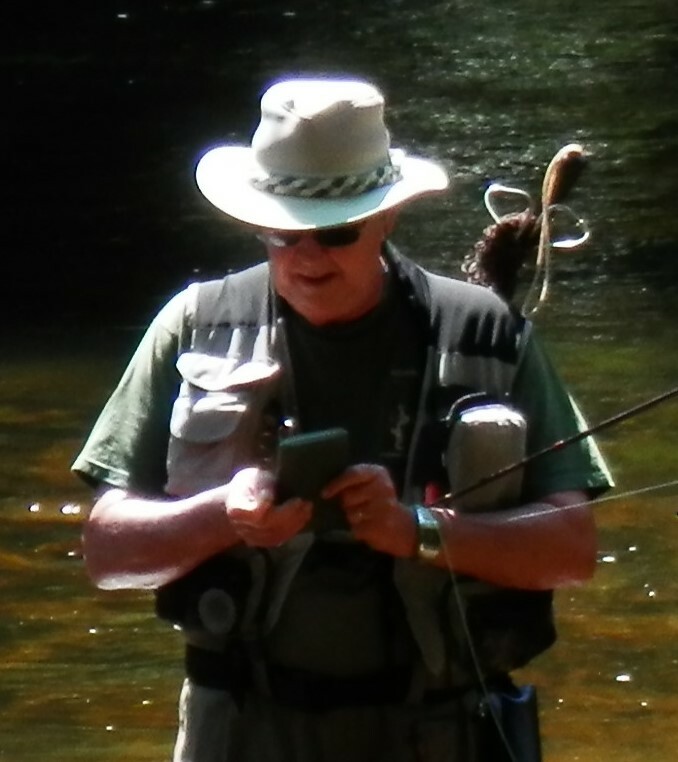 Despite my many years of fishing, I took in an abundance of information that I had not previously considered. This especially concerned the quality of the waters we fish and how to maintain them. Also the identification of the plants found in and around lakes and on the river bank, as well as the wildlife. It surprised me that everyone on the course learns the practical elements of knots, setting up equipment, including fly-fishing leaders with droppers. Attaching hooks of various types including the dreaded spade hook. A whole afternoon was spent on how to humanely kill a fish, which each of the students had to demonstrate. The method which is often used i.e just stunning the fish is not accepted in Germany. You would leave the way open for possible prosecution for cruelty to animals. On completion of the course, the instructor recommended that I sit the examination. I waited with bated breath for weeks until my Summons to the State Examination arrived. The letter duly arrived and on the appointed day I presented myself, with about thirty other candidates to the examination centre in Regen. The invigilators scrutinized Photographs in passport or identity cards. This ensured they were genuine and not a proxy sitting the exam to ensure a pass. The examination was strictly invigilated and consisted of twenty questions in each of the five sections, a total of one hundred questions in all. I completed my paper well in time, checked it twice and handed it in. The Examiners checked my paper whilst I waited patiently. The Examiners called me forward to receive the result. I had achieved a grade of 98%! Having passed the exam, I had to wait about a week for the official notification from ‘The Ministry’. I now had a very nice and ornate Certificate also the official notification. Armed with the notification, I went to the licensing office at the local Rathaus or Town Hall. Finally, the clerk issued me with my State Fishing License, a legal photo identification document, valid for life (due to my age). Despite my initial reservations, I believe that the fishing course was very worthwhile. I am so glad that I attended. My knowledge of my chosen sport has extended, especially in areas that I had not previously considered studying. This included Water Science and the Law relating to the sport, plants and aquatic life. The requirement for such a high level of knowledge surprised me. All holders of the German State Fishing License should feel proud of their achievement, I know I do! 100% = You have obviously done the course! 75% = You probably only just passed the course! 50% = You probably live in or near Germany! 25% = You are probably a Visitor to Germany! 0% = It is time you did some fishing in Germany!